One of the problems with generation focused ministries (youth ministry, young adult ministry, seniors ministry, etc) is that isolation can happen very easily. On one hand it is good for people who are at the same stage in life to have time together. It is helpful for young parents and newly marrieds to talk with others in the same situation and learn and bond through those times. 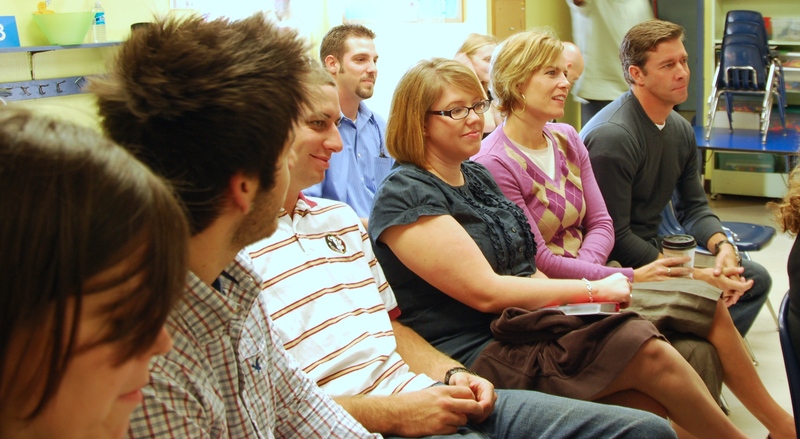 However, a problem arises when those are the only connection a young person has in the congregation. Isolation can set in and a tremendous disservice is done to the ministry for failing to connect them with the broader congregation. There is much wisdom to be gained from having relationships with those who are more experienced than ourselves. One thing our 20s & 30s ministry is doing in the month of January is to do Q & A sessions in Sunday Bible class with the more experienced in the congregation. Last Sunday we had in three of our elders and their wives and the class asked them questions for a full hour. It was very informative. It made our elders seem more approachable. It connected our class with them, which might open up more doors in the future. Overall, it was a very healthy and needed experience. This Sunday we are having two couples in our class who are a few decades older than most of the people in the room. I am very excited about this because it means our 20s & 30s will learn from them and they will grow closer to them through this process. In a few more weeks we are going to have several of the most senior members of the congregation in to talk with us. This is just one way to connect a young adult ministry with those who don’t fit demographically into the group. I think it is extremely important that ministries don’t become isolated or insulated from the rest of the congregation. That happens when the only people they spend time with are others their same age. I have mentioned before that we have already been making efforts to reach downward as well. We send members of our class down to the college class to teach and encourage them. We also send 20s & 30s into the youth group to get to know them. What this does is help the younger people feel more connected when it is time to “move up” to the next class. It is hard to break into a class or ministry where you don’t know anyone. Many people fall out before they will take that step. So we are trying to be proactive and preventative to make sure that doesn’t happen in the future. Matt, to quote Ronald Reagan, “there you go again…” Trying to turn something that is supposed to be theoretical, ephemeral and esoteric into something that is useful and profitable. 🙂 Great ideas, by the way…do you mind if I steal them? I especially like the idea of having the elders and their wives visit a class – could also be very valuable for teens (at least older teens). Steal away! I have decided the question is no longer what information do I need to give them. Instead, it is what is the best way to use that 60 minutes to transform and engage them spiritually. That requires information and obviously, Bible study is a huge part of it. It just comes from a different direction and has a different purpose than coming to just learn information. That perspective has lead to things like this, if that is helpful.